The inspiration for this recipe comes from the The Health Promoting Cookbook by Alan Goldhamer. 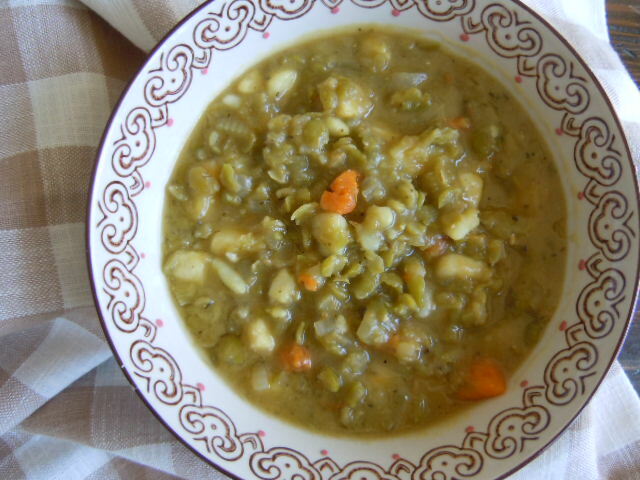 I had to adapt a few of my favorite ingredients from other split pea soup recipes and the results were so fantastic that I have made this soup twice! It’s on the menu again this week. Although the yams in the soup photo look like regular potatoes they are actually a Hannah yam that is white inside – they are so delicious. In a large soup pot bring the water, broth and split peas to a boil. Add the yams, celery, carrots, onion and spices. Simmer for one hour or until split peas and veggies are fully cooked and tender, stirring occasionally. Remove bay leaves before serving. We like our soup to be chunky but if you prefer a creamy smooth soup you can put it in a blender in batches and process until smooth. This soup freezes well. Pressure Cooker option – toss everything into the pressure cooker, put the lid on and cook on high for 8 minutes, quick release pressure and enjoy. Slow Cooker option – toss everything into your slow cooker – cook on high for 4 hours or low for 8 hours. Adjust cooking time according to how hot your slow cooker is. Mine runs super hot and things always cook way faster in it than what recipes state. Note: You can use any kind of yam or sweet potato or even a Yukon Gold potato in this soup. I prefer the Hannah yams – they add a sweetness and don’t break down like the garnet yams do. Previous Post: « Paderno Spiralizer Kitchen Fun! Tried this today in the pressure cooker. It was absolutely delicious. Thank you Tami! My omnivore hubby loved it too, so it’s another winner from your website. Caroline that’s awesome! The pressure cooker is so handy to have – I am loving it! Happy Healthy cooking! I am making this today, it looks delicious! Thanks Tami!! You are so welcome! I made it too and froze a bunch of it! Hi Tami, I made this today in my Instant Pot. It is really delicious and I’m going to serve it for Easter. I used 2 Tbsp of Herbs de Provence and omitted a salt substitute. Lovely recipe. Thanks for sharing.